Owen Plummer’s practice covers a range of media from drawing, to painting, to murals, to comics, and underground zines. His work has been shown in Paris, New York, London(UK), Toronto, Edmonton, Philadelphia, Montreal, and Romania. He is currently working on solo art work for a book to be published by Perro Verlag and he is doing collaborative work with artist James Whitman. 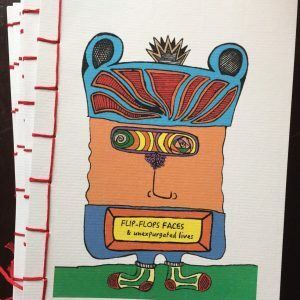 View cart “Flip Flops Faces and Unexpurgated Lives!” has been added to your cart. Flip Flops Faces and Unexpurgated Lives!